This isn’t the fun kind of haunted mansion, Guillermo del Toro has seen to that. The Pan’s Labyrinth director has returned to the creepy and macabre, bringing along all of your favorites! Tom Hiddleston, Jessica Chastain, Mia Wasikowska, and Charlie Hunnam all star as classy Victorians in a world full of ghosts. When Edith (Wasikowska) marries Sir Thomas Sharpe (Hiddleston), she moves into the stately, and clearly super-haunted, manor he shares with his sister Lucille (Chastain). However all is not quite what it seems (it never is). With the help of Dr. McMichael (Hunnam), Edith tries to uncover the deathly secrets of Crimson Peak. 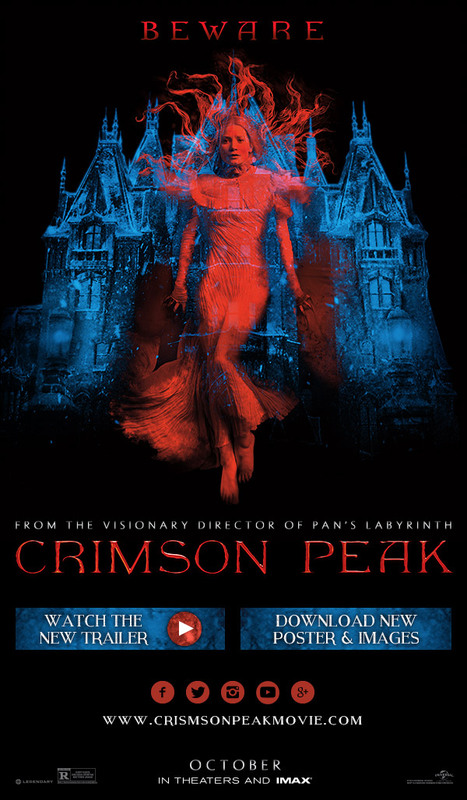 With beautifully creepy visuals and an amazing cast, Crimson Peak drags its bloody way into theaters October 16th.